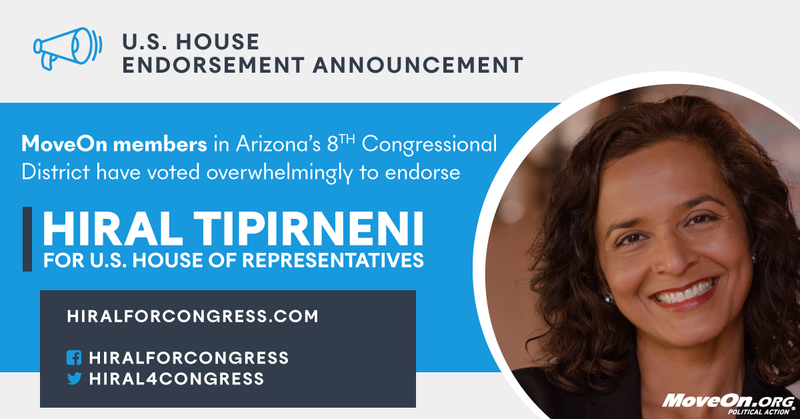 Members of MoveOn.org Political Action in Arizona’s 8th Congressional District have voted overwhelmingly to endorse Hiral Tipirneni for Congress. In Arizona’s 8th Congressional District, 99% of votes cast by MoveOn members were in favor of backing Tipirneni. MoveOn’s endorsement comes ahead of the April 24 special election in Arizona’s 8th Congressional District. Dr. Hiral Tipirneni isn’t a career politician. As an emergency room doctor, she knows first hand the life and death consequences of health care policy. As an immigrant, she’s living proof of the American Dream and understands how immigration laws impact our families. And as an advocate for cancer research, she’s a proven problem solver and someone who will protect Social Security and push to expand Medicare to cover everyone. The contrast between Tipirneni and her Republican opponent, Debbie Lasko, couldn’t be more clear. And in races across the country, progressives are winning shocking upsets in traditionally Republican districts just like AZ-08. MoveOn.org has 7,200 members in Arizona’s 8th Congressional District, who will mobilize to volunteer and vote for Tipirneni. This cycle, MoveOn members have also endorsed seven Senate candidates: progressives Tammy Baldwin (WI) and Sherrod Brown (OH), who are running for reelection in states Trump won; Beto O’Rourke (TX); as well as progressive champions Mazie Hirono (HI), Chris Murphy (CT), Bernie Sanders (VT), and Elizabeth Warren (MA) for reelection. MoveOn members have also endorsed Chuy García (IL4) and Veronica Escobar (TX16), Conor Lamb (PA18), and Gina Ortiz Jones (TX23) for Congress, and gubernatorial candidate Stacey Abrams (GA). In 2017 and 2018 to date, MoveOn members have contributed $1.5 million to candidates—including $250,000 for Senator-elect Doug Jones (AL) and $620,000 for Sen. Elizabeth Warren’s (MA) reelection. In 2016, MoveOn members raised $1.2 million for Bernie Sanders’ presidential campaign, mobilized volunteers, and ran ads in support of endorsed candidates.